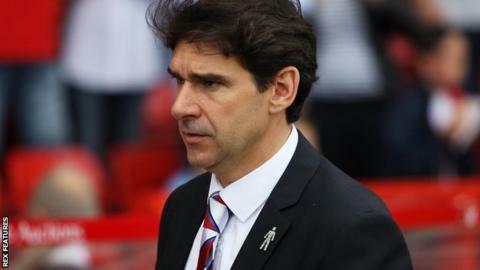 Middlesbrough need to show more "ambition" if they are to remain among the Championship promotion favourites, says head coach Aitor Karanka. Having edged Rotherham 1-0 in midweek, the Teessiders were brought to ground by a 3-0 away defeat by Hull City. Karanka was disappointed his side failed to build on a bright start, and conceded ground at the league summit. "If you are confident on the pitch you need to score goals and win the game," Karanka told BBC Tees. "It's no coincidence that we scored an early goal against Rotherham but had problems finishing the game at the end, and today we started well, but Hull are not Rotherham and they scored three and could have scored four or five. "My only thought can be that we need more ambition." Defeat leaves Boro fourth, four points behind leaders Hull City. Meanwhile, there was further concern for the Boro boss when striker David Nugent was taken off with a hamstring injury early in the second half. The international break gives the club time to get Nugent ready for the visit of QPR on Friday, 20 November. "It was his hamstring - we have two weeks now to rest," said Karanka. "We will train and prepare but I hope it is not something serious. "We need to wait the two weeks, to work and think about the game today."